The Orioles finally spent some money. Hopefully this move will mean a few more are coming in the next few days. Still need OF, DH, and a SP. Plenty on the market. I like Balfour a lot. Was an absolute stud last year posting a 2.59 ERA with 38 saves. Only 72 Ks, but he gets the job done, and is an absolute savage. 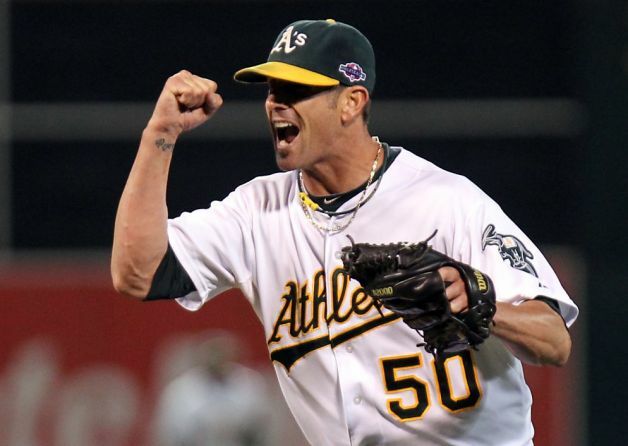 A’s fans loved this dude, would go wild when he entered the game. He’s the perfect closer to land in B-more. A little surprised he went so cheap. I know he has injury issues, but dude was an All-Star and reliable all season. This entry was tagged Baltimore, Baltimore Orioles, Grant Balfour, MLB, Oakland, Oakland Athletics, Orioles. Bookmark the permalink.